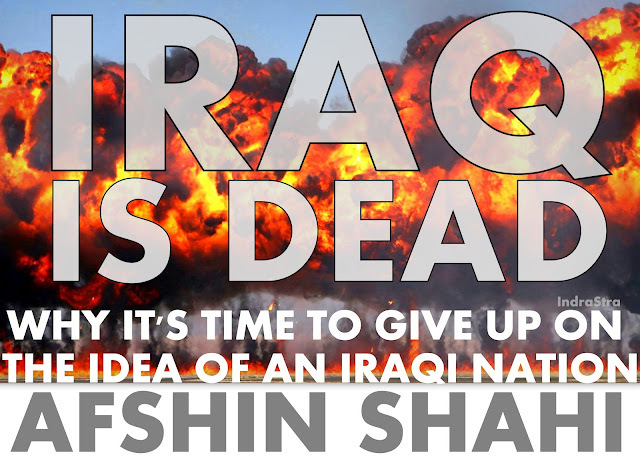 The end of Iraq is no longer a matter of if, or a matter of when – it has already happened. The country has been on life support for too long, and no matter how hard external players try to save it, Iraq cannot save itself. One of the fundamental properties of any nation state is some sense a national consciousness, a sense of belonging; shared values regardless of how abstract they may be and, most importantly, a collective commitment to the perpetuation of the nation itself, which is perceived to be organically connected to the state. Without these ingredients, there never can be a stable nation state. Of course, one could argue that perhaps Iraq never had a cohesive national consciousness anyway. After all, Iraq was only constructed almost on a whim by the colonial masters of the previous century. Even at the height of “stability” under Saddam Hussein, Iraq was a state without a nation. There was very little effort put into building an Iraqi nation and the obstacles were always huge. The Kurds, who made up about 17-20% of the population, hardly subscribed to an Iraqi identity, and the Shia majority felt deeply marginalized by the political elite who were mainly Sunni. But what’s happening in Iraq today is different from the realities of a classic multi-ethnic or multi-religious society in the Middle East. Similar situations and grievances exist in much of the region, but what makes the situation hopeless in Iraq is that there is no longer any strong state in power – and, more importantly, no prospect of one emerging any time soon. Until 2003, Saddam’s Hussein’s repressive state at least put a lid on the chaos, but invasion, disastrous post-war policies and the opportunistic interference of regional states and sub-state actors finally let the genie out of the bottle. The forces unleashed are now beyond control, and old animosities between ethno-sectarian groups are channelled into armed confrontation. This cycle of violence has effectively burned any grassroots bridges between the divided groups, who were supposed to be part of a nation, and these problems are here to stay even if Iraq cleanses itself of transnational jihadism. The rise of Islamic State (IS) reflects a history of poor nation-building as much as anything else. The international coalition against IS has so far been ineffective but, in any case, cutting down IS without pulling up its roots would be nothing more than cosmetic surgery. IS is not really a threat to Iraq’s nationhood, rather a sign of its failure. The current hyper-sectarian conflict is not the cause, but the symptom of the failed nation-state model. The country is divided into three parts, each of which centres around strong identities – Kurdish, Sunni and Shia – which predate the modern borders. For each of these groups, self-interest comes first. The Kurds' loyalty is first and foremost to Kurdistan – and they see an opportunity in the current chaos to realise their long-term dream of a Kurdish state. In many aspects, the Kurdish region is already independent, and given what they have gone through over the years spent resisting IS, it would be inconceivable to imagine them embracing the old system. Southern Iraq, meanwhile, is effectively a country of its own. The majority of Shia live in the south with a very strong sense of Shia identity. The Shia political elite has dominated what is left of the Iraqi state and has shown little appetite for acknowledging the interests of other ethnic and religious groups – which would have been the only way to save Iraq. After all, in this hyper-sectarian climate being attentive to other minorities could have negative implications for a “state” which is effectively dependent on Shia militia for survival. Many Sunni tribes, on the other hand, are stuck between the likes of IS or a Shia majority government, which has a track record of discrimination against them. In the same week that there was an anti-IS coalition conference in Paris to try to save Iraq, 50 more Sunni tribes gave their allegiance to Abu Bakr al-Baghdadi because they feared the rise of Shia militia with links to Iran. So what could be the answer? Democracy? Federalism? Iraq’s hyper-sectarian politics would never allow a democratic system to flourish within either a federal or centrist system. Sectarianism destroys the roots of civic culture and undermines the development of any functioning civil society, which is the backbone of any democratic system. As has been proven time and time again in Iraq, people vote to empower their sect, meaning the Sunni minority will be perpetually disadvantaged. This inevitably feeds the politics of victimisation and, in turn, leads to endless battles over the distribution of power between the haves and the have-nots. Although there are uncertainties about the result of this painful disintegration process, there is very little chance that an Iraqi nation state like that we knew before 2003 can ever be resurrected. It’s about time we faced facts: Iraq is dead.